There are so many large scale knits out there that it is nice to break it up with a hat. What is a large scale knit you might wonder? A sweater or blanket, anything that takes many many meters of yarn. For me, these kinds of projects are often broken up by smaller projects like hats or mittens, knit at the same time as the sweater. This might be why I finish fewer large scale knits than others…. Around the knitting circle on Fridays there have been a number of hats lately. 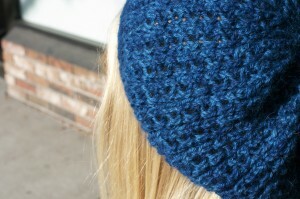 The one that I think almost everyone has knit is the Starcrossed Beret. 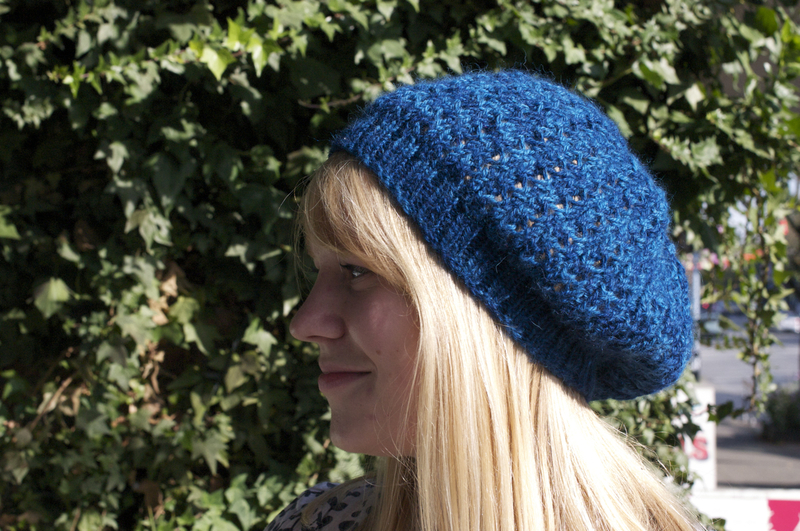 Kim knit one up in the super soft Pear Tree yarn this week and I’m completely in love! I’ve knit this one myself, but mine really lacked the slouch I was looking for. This might be because my needles were a size too small (I know, I work in a yarn shop and I still thought it would be just fine to use needles a size too small, I’m not sure what I thought would happen) and I really felt it could use an extra pattern repeat. Then it would be perfect. Unfortunately it needs a full rip out so I haven’t gotten up the courage to do that yet. Kynna has been a knitting machine these days and she finished two super cute hats. I also think she has fabulous taste because I’ve knit both of these hats myself. 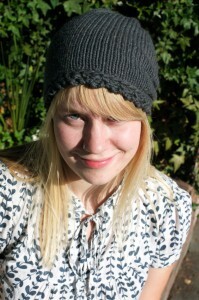 The first is Ripley, a really cute pattern from Ysolda Teague. I love the way Ripley looks with the pleats in the back to make it a slouchy and kind of a hipstery hat. There is both a plainer version and a lace edged version of this hat. 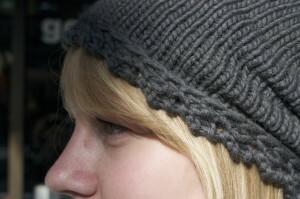 I knit the lace one in white while Kynna went with a nice charcoal grey. The yarn is one of my faves (have I mentioned it a million times yet?) Blue Sky Alpacas Worsted Hand Dyes, both Kynna and I got our hats out of one skein. What a treat. The second hat is Porom by Jared Flood. It’s another slouchy beret (as they are all the rage) with a simple lace stitch. 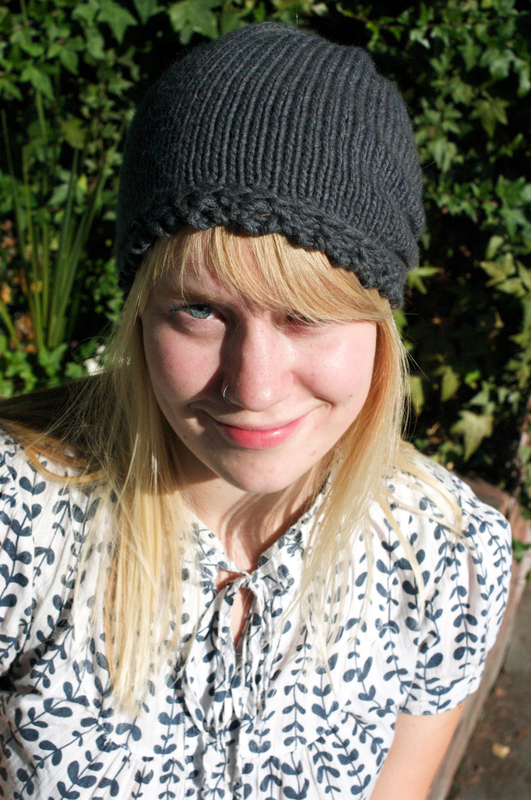 Kynna and I both knit our hats from Shibui Alpaca and they are soft as clouds. My pink hat looks pretty darn good on my head (I have a lot of curly hair) but it looks a little hilarious on the mannequin, a little more rasta than slouchy! Kynna knit hers a little shorter and it looks quite regular both on her head and on the mannequin head. Great taste as usual Kynna! This entry was posted on Friday, November 12th, 2010 at 11:32 pm	and is filed under Uncategorized. You can follow any responses to this entry through the RSS 2.0 feed. Both comments and pings are currently closed.